White flat boxes are the perfect boxes when you have to ship medium or large sized flat items. Not all boxes can accommodate the goods you want to deliver in a safe manner however our boxes are specially made for rectangular flat items. They are crisp white in color and you can also print or stick additional details if you find that useful. The information will stand out against the white background and look appealing. These boxes are also strong and robust to keep the goods safe and secure. White flat boxes are extremely convenient to hold and come in various sizes. They work best when you have to ship flat products but they are also very efficient when you need to store them in a warehouse. They provide adequate amount of protection from rough and tough handling during deliveries. 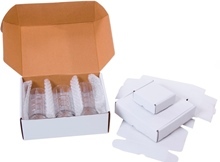 These white flat boxes for packaging are extremely easy to use and user-friendly regarding the way they are packed. They are strong and robust enough to keep even the most fragile goods safe. They come in 3 Ply, 5 Ply and 7 Ply sizes. Greater the number of Ply in a box, greater is the strength of the boxes.Besides the Ply, the boxes we provide at DCGpac are 30% stronger than the ones you get in the market. Our white flat boxes maintain the highest strength standards and are of BF10 strength so you never have to compromise on the safety of your goods.It can also handle a compression of up to 60 kg so be assured that this boxes can take a good amount of mishandling while deliveries. The peculiar thing about these boxes is that they are eco-friendly and do not harm nature like the other plastic packaging material would do. The xoxes sole at DCGPac.com are sold at lower rates than the market rates. You can avail these white flat boxes online from DCGpac and save your money since we provide all our goods at wholesale prices. Order them now and get them quickly delivered to your doorstep. We are the best providers of packaging materials in India.